Hi Copic Friends! It's Thursday, and I'm (Linda) here to share a card. Today's creation is quite simple, but I like the way it turned out. It is a birthday card for an elderly gentleman so I didn't want to embellish it too heavily with flowers or ribbons. 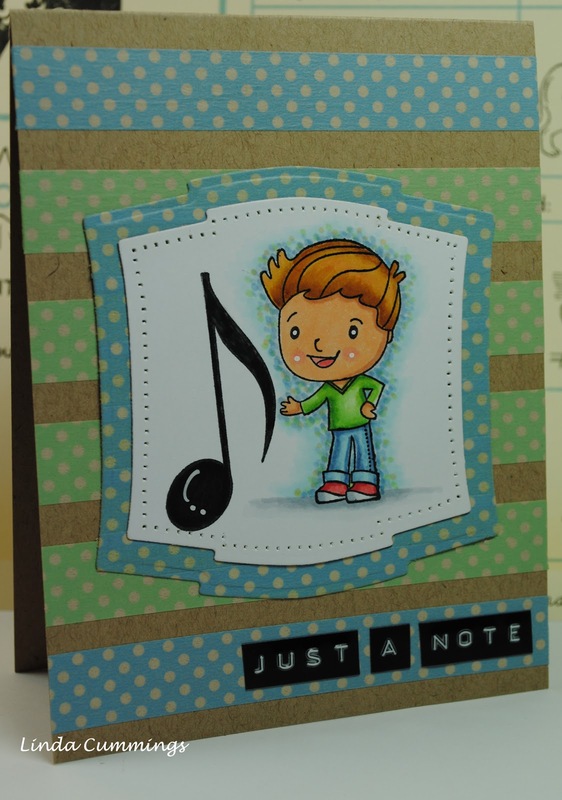 The background of the card is decorated with blue dotted and green dotted Washi tape. I also covered a piece of scrap paper with the blue tape before I cut it with a Nestabilities die to mat the image. Since the Washi tape is an adhesive I chose not to have thread in my needle when I 'sewed' around the image. I used the method Sam introduced in Tuesday's Tips and Tricks to create the background around the image. The image I used is Your Next Stamp's 'Musical Ethan'. Thanks for stopping by. Check back tomorrow to see what Alyssa has to share. Don't forget our Color Challenge #19 from Monday's post. We love to see your creations, and don't forget there is a prize! LOVE how you did the tape on the Nestabilities die! And your background is amazing! I super love it!